Ancient hay meadows have been lost to modern farming practices and wet meadows have been drained, damaged and destroyed. Unspoilt habitats are hard to find but the bobbing heads of fabulous fritillaries can still be seen at a few sites in southern and central England. Some of the best know fritillary fields are in Oxfordshire, along the floodplain meadows of the River Thames. Voted as the county flower of Oxfordshire, snake’s head fritillaries grow in abundance at Iffley Meadows in Oxford and behind Oxford University’s Magdalen College, where they have been recorded since 1785. The small village of Ducklington even hosts ‘Fritillary Sunday’, a typically English event with cream teas and plant sales. Ducklington Mead is a Site of Special Scientific Interest (SSSI) and opens to the public for just one day a year. Want to see more? Step over the border and into North Meadow National Nature Reserve, Cricklade, Wiltshire. This flower-rich hay meadow is an important botanical research site that has been sensitively managed for centuries. The result? It supports 250 plant species and is home to an estimated 80% of all British snake’s head fritillaries. Numbers vary each year but average over 500,000! Snake’s head fritillaries spring to life in April and May. Their delightful bell-like flowers have a chequerboard pattern and bloom in shades of purple or pure white. 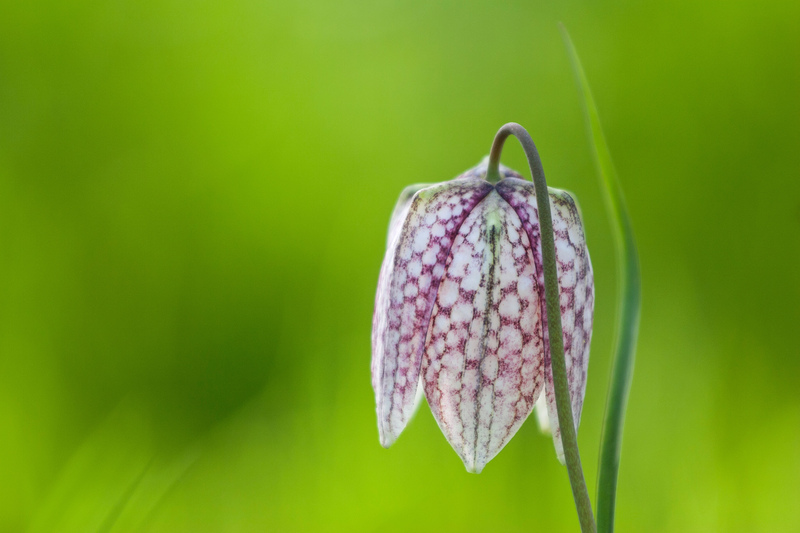 ‘Fritillary’ is derived from ‘fritillus’, the Latin for a chequered dice box whereas the common name for this pretty little flower describes the snakeskin pattern and shape of its closed bud. 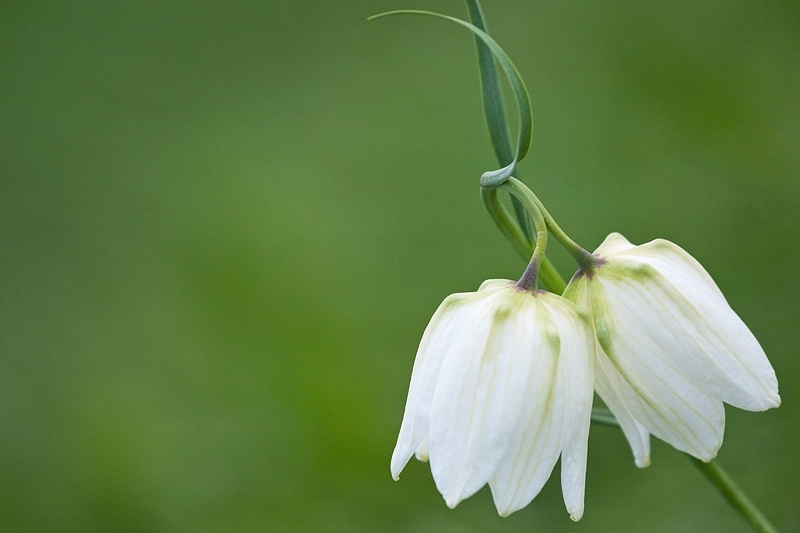 Fritillary flowers were once known as leper lilies or Lazarus bells due to their resemblance to bells worn by lepers in the Middle Ages. Quite an ungracious name for one of Britain’s most beautiful, nationally scarce, wild plants. If you’re lucky to see a wildflower display at one of our traditional wetland meadows, please tread with care…there might be snakes in the grass! 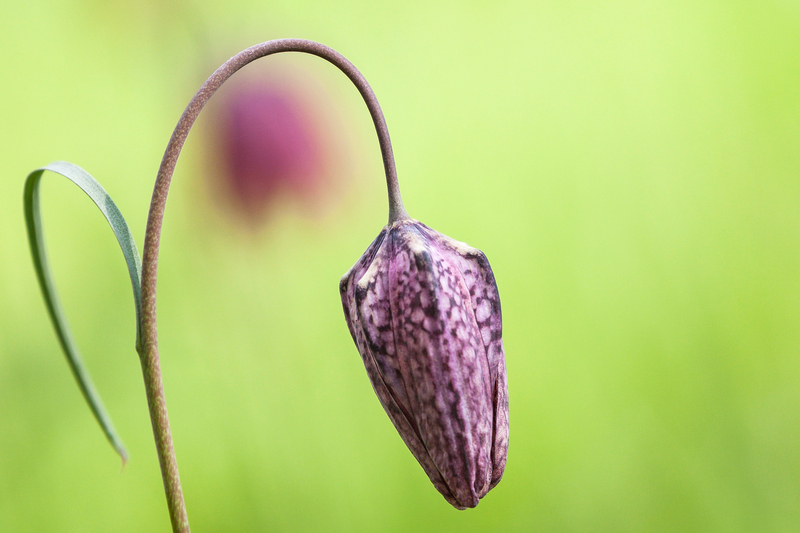 Visit the wildflowers gallery for more snake’s head fritillary pictures.